Warning: The video shown here contains major spoilers for Borderlands 2's end-game events. Watch at your own risk! Someone should check the temperature of Matt "BLiTZ" Siegfried's hand. It's probably smoking by now. The Ohio State University student and self-proclaimed "multi-genre world champion, speedrunner, high-score chaser, tournament player, and co-op lover" posted a Record Setter video of himself and a co-op buddy reaching the maximum level of 50 in Gearbox's FPS loot-fest in just 43 hours, 15 minutes, and 23 seconds. A few rules governed Siegfried's attempt: He started at level 1 with no pre-earned bonuses or equipment collected from secondary characters, he could play alone or with co-op assistance (who also must level from 1 to 50), and he provided video evidence. All 43 hours of Siefried's run are viewable on his Twitch page , but a culminating clip showing the last few minutes before Sigfried's character dinged onto the big 50 is shown here. Once again, all of the above media holds significant spoilers , so avert your eyes if you don't want any plot elements ruined. 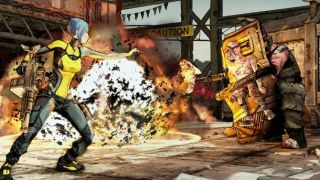 Why not read our Borderlands 2 review instead?